Fig. 9.2-1. 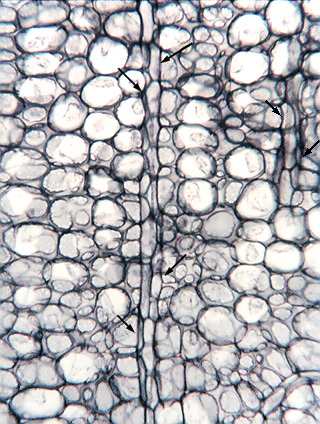 Longitudinal section of laticifer in spurge stem (Euphorbia tirucali). This spurge stem shows a common type of laticifer called a non-articulated laticifer. The word “non-articulated” means that it is all one long cell rather than a series of cells joined together (the vessels of xylem are articulated structures made up of many cells, the vessel elements). The laticifer here runs vertically in the center of the micrograph, with four arrows pointing it out; the side micrograph shows the same structure, just colorized to help us see it more clearly. It is a very long tube-shaped cell with many nuclei (they are not visible here), and its walls are scalloped where the surrounding parenchyma cells press slightly into it. The section was cut to be very thick (that is why the parenchyma cells looks so three-dimensional) to increase the chances of catching as much of the laticifer as possible. If the stem had been cut in transverse section, the laticifer would have appeared to be an ordinary round cell. If cut at an angle, it would have appeared oval or somewhat elongate. Only by having a good longitudinal section can we see that it really is a tube, and the thicker we cut the material, the more likely we are to see a long expanse like this. The colorization stops just above the bottom of the micrograph because the laticifer was curved and either came up toward us or back away from us – either way, it left the section. If we had serial sections (that is, many sections, all in order), we could examine those sections cut before and after this one, and construct a map of the laticifer. There is a good chance the cell extends many centimeters, maybe even meters. There is a fragment of laticifer in the upper right corner of the large micrograph; it might be a separate cell, or it might be a branch of the main laticifer – serial sections would let us determine which it is. The term “milkweed” is applied to many plants that ooze a white, sticky liquid when cut, and mostly they belong to the spurge family (Euphorbiaceae -- not so common in the United States) and the milkweed family (Asclepiadaceae – fairly common in the US).